Content Marketing World is the one event where you can learn and network with the best and the brightest in the content marketing industry. 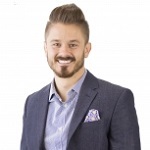 You will leave with all the materials you need to take a content marketing strategy back to your team – and – to implement a content marketing plan that will grow your business and inspire your audience. 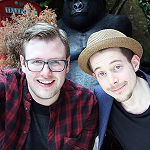 We want to inspire you to create your own epic content marketing and network with some of the brightest in the business! We want to help you build your team and your personal skills. Over 120 sessions and workshops presented by the leading brand marketers and experts from around the world covering strategy, storytelling, ROI, demand generation, AI, and more new ideas than you can shake an orange stick at. In 2018, 3,700+ marketers from over 50 countries joined us – we expect even more in 2019! More brands, more breakouts, more hands-on forums, more networking (yes, it’s possible!) and more CONTENT! 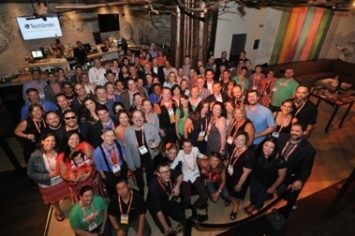 CMWorld 2019 Registration is now open! Register now for the best rates! 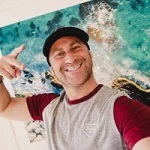 Early bird pricing ends 5/31/19! keynotes, sessions, networking & entertainment! 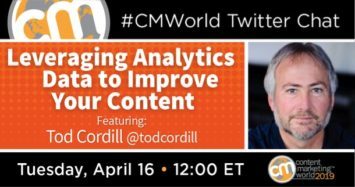 Leveraging Analytics Data to Improve Your Content: A #CMWorld Twitter Chat with To Cordill Tod Cordill shared how Google Analytics can show us what worked, what didn’t, and how that information can be used to better your content marketing efforts. 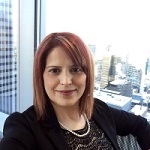 Community Tips: Higher Ed Marketing Gabriela Cardoza works with academic institutions on content marketing strategy and execution. 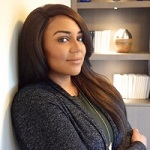 She shares her journey to content marketing and tips for success. 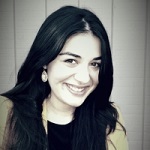 10 Reasons Why a Content Marketer’s Life is Never Boring Marketers are not boring people. Here are 10 reasons why we’re living the life. 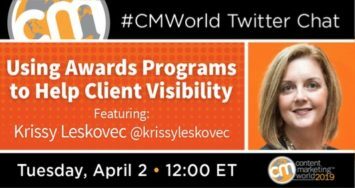 Using Awards Programs to Help Client Visibility: A #CMWorld Twitter Chat with Krissy Leskovec Submitting an entry into an awards program can play an important part in your business. 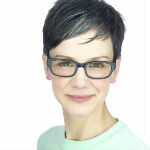 Mastering Paid Social Media with Cathy McPhillips Brands are left to rethink their paid strategies with organic reach plummeting. 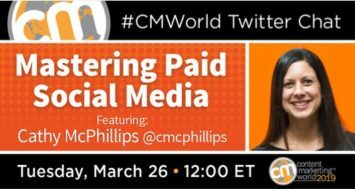 CMI is no exception as we discuss navigating the paid social media waters. 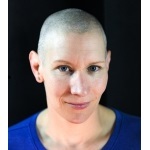 Tips for Delivering Effective Presentations with Andrea Larick Getting up in front of an audience is difficult. Making a lasting impression is even harder. 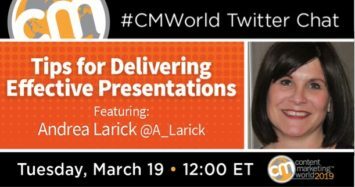 The #CMWorld Twitter chat was filled with tips that will help.